Joe Nora fell into a pool. That’s all you need to know. The San Francisco producer (who currently resides in LA) recently released his debut full-length through instrumental label Inner Ocean Records. The album, Fell into the Pool, is a ten track masterpiece. An LP stuck underwater, paddling through blue waves. It sounds like braving the high dive with a spliff between your lips. Aquatic bumps fitting as a soundtrack for your next boat party. I spoke with the talented artist about the album’s process, the abstract artwork, what he has planned around the corner, and much more. Press play if you haven’t already and buy a cassette while you’re at it. How long have you been working on Fell into the Pool? What was the motivation/inspiration for the title? Ok so my first idea for it came when I was in Kalamazoo, Michigan last summer. It was a really beautiful day and for some reason my friends kept saying things that caught my ear as being good song titles. We were walking along outside and Shai-li was talking about something that happened to her in high school and said "...the ceiling fell into the pool" to which I immediately was like, "Wait, what did you just say? That was amazing, can I call my album that?" and so for a while I thought that was what it was going to be. But it started to feel too long ,so I shortened it, as much as I liked the visual that it gave from a disaster like that it didn't quite fit. As a kid I was pretty much raised around pools. My mom was a swimmer in high school and college and I have always felt drawn to water and sea creatures and whatnot. This album is kind of all about my first steps into the world and my first step into the music industry as Joe Nora since this is my first album. 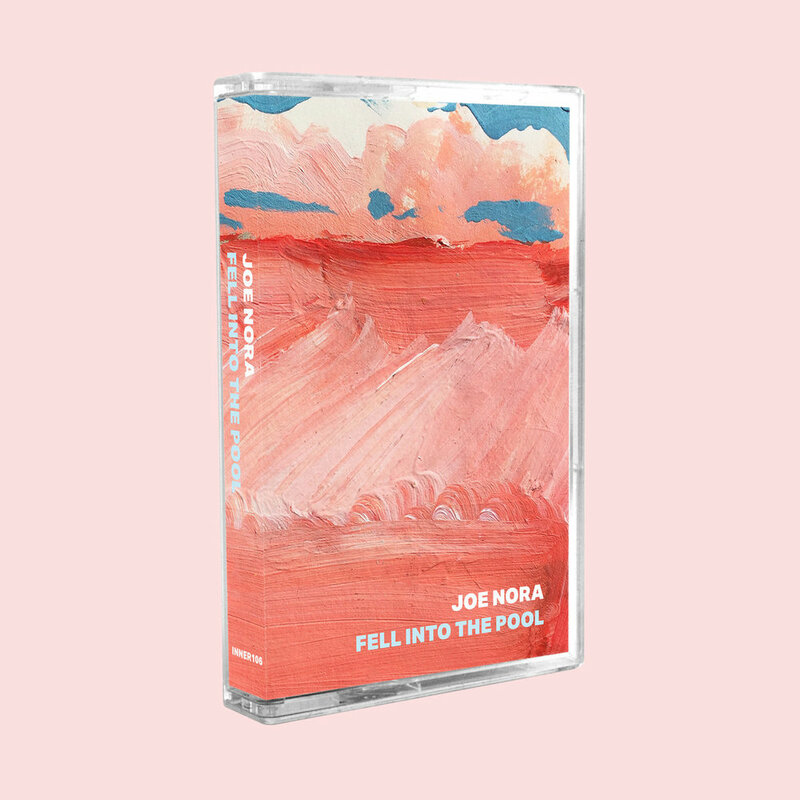 I also liked that it kind of read like a little story if you say it with my name in front of the album title: "joe nora fell into the pool" just felt right. Can you describe a bit about the artwork? Were other covers considered? I had a picture of me in a pool swimming under the water looking up at my mom as she took the picture from outside the pool that I was initially thinking of for the cover. It was taken on the same trip to the Midwest on which we came up with the name of the album that I talked about before. I loved the bright blue colors of the water but there has been a lot of artwork over the past year that was something along those same lines. Underwater portraits have been done already and I wanted to see what else we could try to come up with while still keeping this in mind. James Hardwidge is an absolutely inspiring visual artist friend of mine from high school and we had done some stuff together before so I thought I'd see if he would be down to contribute. He has stacks of blackbooks of doodles and paintings that have I always loved flipping through and I asked him if I could choose a couple pages out of some of his books to try to use as art. He obliged. The red and blue painting that is the cover is what I found in his book that resonated the most with me. It looked like a red ocean and some smoke in the distance like there was an explosion or something that had happened over the water and that kind of fit exactly with what I had in my head for the album. Sort of melancholic but surreal and aquatic. The guys over at Inner Ocean still liked the initial pool photo so we kept that for the back cover and the inside of the cassette jacket on the physical release. I will probably go back to trying to put out more regular scheduled content on my SoundCloud now that this big project is out in the world but there is also a compilation coming out this month that I have a track on that I am very excited for as well. I also want to work on my live sets to get them sounding as good as possible since I have been getting more shows lately and want to continue to do so. Where's your favorite pool you've ever swam in? A damn fine question. I would have to say that the pool that you’re not allowed to be swimming in is always the most fun. There was one we swam in on a New Year’s Eve a few years back that we kind of drunkenly took our clothes off and jumped in even though it was an apartment or hotel pool or something that we clearly weren't supposed to be in. People walked by and just assumed we were guests or something and didn't seem to notice we didn't have suits on. Good times. Have you ever jumped off the high dive? I think so, my mom is from Lincoln, Nebraska which we used to visit every summer. Those trips would involve a lot of swimming and there was one pool which had a high dive that I definitely remember. Was pretty young at that point so can't remember for sure if I went off the full size or half size but that was a blast. Outside of your own music, what have you been listening? Smino, James Blake, Clairo, Beabadoobee, Shigeto, Chemtrails, and Naji to name a few. I have a "sexxee" playlist on spotify which has been my go-to lately which is filled with mostly smooth well-produced vocal tracks including most of these artists I just listed. But also a lot of Bossa Nova classics. It's sunny out and feeling more like summer in LA again and I always start listening to Bossa Nova when it starts to feel like that again around here. You also just released a track with Shrimpnose. Can we expect some other collaborations down the road? Yea stoked to have a track with Shrimpnose. We have been in contact for a while now, glad it worked out. Also yessss!! I actually have a big collaboration project with Karavelo, one of my favorite producers right now, which I am extremely excited for. Our workflow was really amazing back and forth, one song together soon turned into a full length project so keep an eye out for that later this year or early next not sure when yet. Also working with Goosetaf on some things as well as the homie David Chief and the Fairrose crew out here in LA who are some of my closest friends and extremely talented/underrated MCs. Any final words / closing thoughts / additional info worth sharing? Just want to say thank you to everyone who supports me and my friends in our music. Shout out Inner Ocean Records for everything and for making my first full project a reality and a physical thing that I can hold in my hand. But other than that man I would say just enjoy life as best you can, support your friends and family. Don't let hate win. Black lives matter.